This article will describe how to connect your Zapier account to Interact apps. 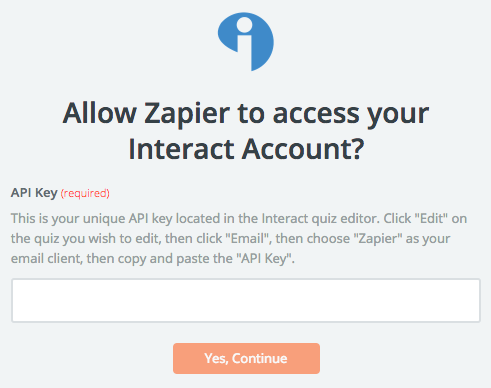 Step 1: In the Interact app builder, under Connect your email list, choose Zapier from the list of integrations. Step 2: Here you will see your Interact API Key. This is required for the next setup steps. 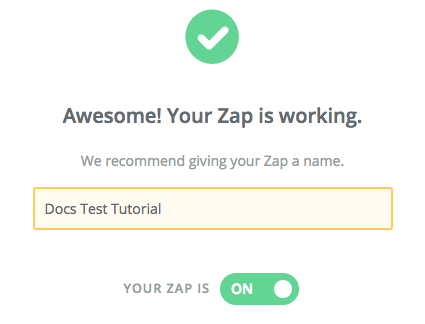 Step 1: Login to your Zapier account and click Create A Zap. 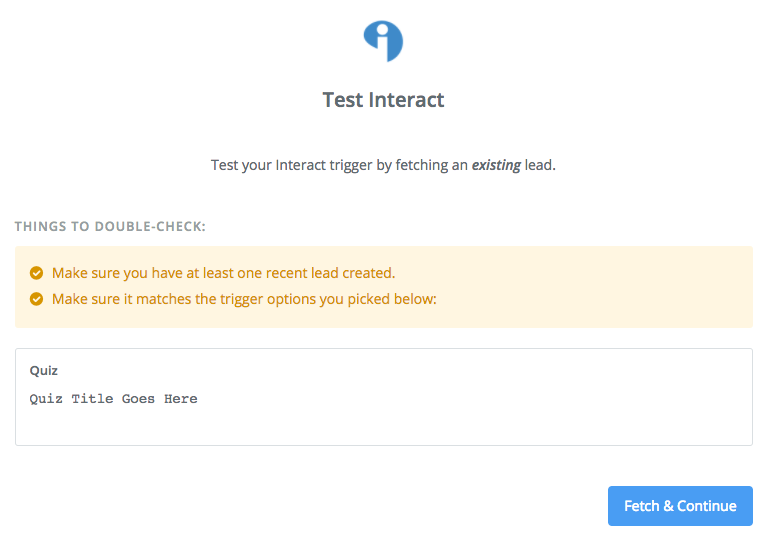 Step 2: Choose Interact as the Trigger App. Select New Lead as the Interact Trigger and click Continue. Step 3: Click Connect an Account, enter your Interact API Key found in the previous section, and click Yes, Continue. Step 4: Choose your quiz from the dropdown and then click Continue. Step 5: Test your connection to Interact by clicking Fetch & Continue. Fix any issues if there are any. Step 6: Complete the Zap Action section completely with whatever you would like to connect with. Step 7: Now make sure you name the Zap and turn it ON. Step 8: At this point, return to Interact and click the button labelled I'm done, complete connecting to Zapier. Then preview your quiz and fill out the form with test data to test your Zap from an actual quiz.